Innovative designer of snowboards who popularised the sport in ski resorts and was admired by fans as the original ‘adrenalin junkie’. The popularity of snowboarding at winter resorts all the over the world — albeit much to the consternation of some skiers between whom snowboarders weave down the slopes — is accredited to Tom Sims who made a prototype snowboard as a schoolboy in Los Angeles in the early 1960s. He later developed it into a commercial product and persuaded sceptical ski resort owners, many of whom had banned snowboards, to embrace the new sport. As a young man he moved from his native New Jersey to Santa Barbara, California and became a well-known member of the growing skateboard scene. He won the skateboard world championships in 1975 and in 1976 he played himself in the skateboard film Freewheelin’ at the height of the craze. Such films attracted even more children to the sport and they would flock to the skate parks to watch the virtuoso displays of Sims and others. Many of them would ask him about his boards and where they could get them. Realising his marketability as one of the stars of the scene he set up Sims Skateboards in 1976. One of his most popular products was a longer 4ft version of the board that he had pioneered to create a parallel with surfing. 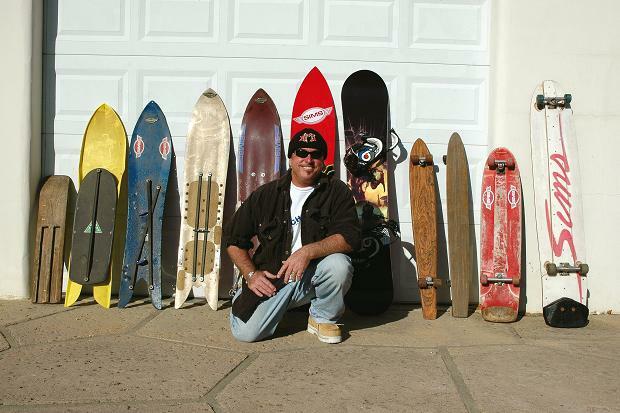 The Sims long board became popular for descents of the hillsides of Californian towns and cities. A scene of enthusiastic young clients gathered around his emporium. To them, Sims was the original “adrenalin junkie” and he proved a very effective populariser of the action sports lifestyle that would later spawn its own culture of terminology, fashion, music and high-energy drinks. By the late 1970s skateboarding’s popularity had begun to decline, not to make a comeback until some 15 years later, and Sims began to focus on the ski slopes. He was an early snowboarding world champion in 1983 and from his new store Sims Snowboards he began to develop and refine the modern commercial snowboard. The nascent sport received the best possible publicity when it featured in one of the action sequences of the James Bond movie A View to a Kill (1985). And Sims was the man the studio turned to be Roger Moore’s stunt double in the daredevil chase scene. Meanwhile, the sport was becoming more organised and, as well as downhill and slalom snowboarding, there was a freestyle version in which the boarder would perform tricks such as somersaults to be marked on the degree of difficulty and artistic merit. Sims masterminded the development the first “half pipe” used in competition at Lake Tahoe in California — a semi-circular ditch made of snow in which the boarder would slide from the top of one side to the other, performing tricks in the air before their descent on the downslope. Sims innovated the first metal-edged snowboard that made for a smoother ride and the freestyle snowboard. He also developed a lighter and narrower snowboard to cater for the growing number of female snowboarders. Snowboarding was recognised as an Olympic sport in 1998 and in some resorts snowboarders became even more populous than skiers. Sims is survived by his wife, Hilary, two sons and a daughter, and by two step-daughters.